If you need large amounts of rubbish disposed of, you can’t simply throw it away as you would any other rubbish, you need to have it taken away professionally. Maybe you’re moving house and have a limited budget as it is to get your old belongings that you don’t need taken away. Perhaps you need your white goods disposed of properly. Whatever your reasoning, you can hire us to take care of your Golders Green rubbish clearance needs. At Go Rubbish Go we won’t charge you extortionate prices and we won’t take you for a ride. Simply call 020 8610 9182 now and speak to one of our helpful staff members who can give you not only advice on rubbish disposal but a free quote. Why wait? Book a rubbish removal NW11 service now and get a heavy discount! We understand that everyone has to work to a budget. Therefore, no matter how big or small yours is, we can work around it and still give you a fantastic Golders Green rubbish removal service. We can afford to do this because many other rubbish disposal companies in NW11 district charge you more than they should, whereas we don’t want to leave you feeling duped. Call 020 8610 9182 now and have a chat with one of our friendly team members. We can then offer you the best deal for your money and pick up your rubbish as soon as you want us to. Don’t hesitate, get in contact today and we can talk you through what we do. 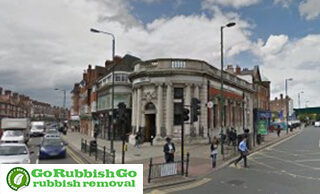 We pride ourselves on being the best rubbish removal Golders Green company in the NW11 area. We’re highly experienced and know the area really well so we can get to you as quickly as you need us to and dispose of the waste efficiently. We can also provide you with not only a phenomenal service but great value for money. We’re different to many Golders Green, NW11 waste collection companies in the area in that we don’t want to just take your money and give you a sub-par service. We want you to get the best value at the best price. 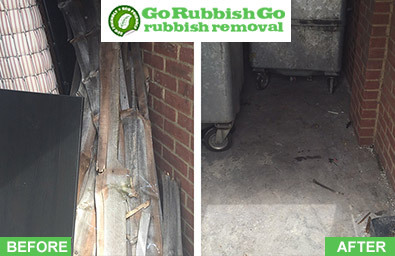 We at Go Rubbish Go pride ourselves on having so many happy customers and that’s our priority. Call us now and get a no obligation required quote. Spectacular help for NW11! This great company did an excellent garage rubbish clearance job in Golders Green and made everything so much easier for me and my family. We had enough space to park our new car and forgot about all of the clutter that used to be around. Very efficient service! Why Our NW11 Waste Clearance Team Care about the Environment? Pollution is rife in the city and therefore we want to do our bit to stay as eco-friendly as we possibly can. We do this in two ways. Firstly, by disposing of any harmful materials appropriately. Many people don’t realise that you can just take a fridge to the dump as it contains potentially hazardous substances. That’s where our Golders Green, NW11 waste disposal team come in. We take it to the correct location and ensure it’s safely transported. In addition, we recycle everything we can from the waste we pick up. Most materials can be recycled now. This is great for the environment as it means we’re dumping less waste and reusing more. Hire us for rubbish removal in NW11and become one of our many happy customers! If you need rubbish removal Golders Green today, give us a call on 020 8610 9182 now to get the best deal in the NW11 area. Not only will we offer you a cheap deal and great value for money, we’ll provide you with a professional NW11 waste clearance Golders Green service. 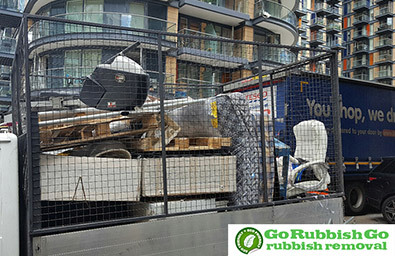 You can rest assured that we will dispose of your waste in Golders Green in the safest, more environmentally friendly way possible, and you won’t have to pay huge amounts of money for it. We won’t pressure you into making a decision right away. Just give us a call and we can give you a free quote to mull over. Speak to one of our friendly staff now. Golders Green is an area in North London within the London Borough of Barnet. It is located 5.5 miles away from the Charing Cross. It is known for being a very attractive place for Jewish tourists and residents. The area has a great variety of housing. There is a very busy main shopping street – the Golders Green Road. One of the most interesting places to visit is the Golders Hill Park. There is a small zoo, different ponds, a water garden and a nice café. There are six primary schools in the area, some of which are Brookland Infant and Junior, Garden Suburb Infant and Junior and Menorah Primary School.